Posted: Monday, August 22, 2016. 12:09 pm CST. By BBN Staff: Now a Tropical Depression, Fiona has become less organized and continues to weaken at this hour due to 35 mph wind shear from the west and mid-level dry air impacting the system. But while Fiona may weaken more in the next day or two, additional strengthening is expected after that as the wind shear is expected to greatly weaken as the atmosphere moistens to the west. 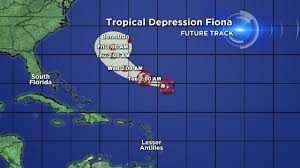 If Fiona manages to maintain her tropical characteristics during this time period, it is possible that she could once again become a tropical storm near the end of the week as she passes to the Southeast of Bermuda, weather reports state. Meanwhile, a tropical wave keeps pushing west toward the Lesser Antilles in the Central Atlantic, producing limited and disorganized showers and thunderstorms. Conditions are expected to become more conducive for development as the wave approached Hispaniola and the Southern and Central Bahamas later this week. A second tropical wave is located about 300 miles South of the Cape Verde Islands and is forecast to become a Tropical Depression in the next couple of days. Environmental conditions will remain favorable for the next several days as this system moves West over the Eastern Tropical Atlantic.